Home > Shop By Brand > McKee's 37 Waxes, Compounds, Coatings > McKee's 37 Paint Coating Bundle - New Formula! Finally - a paint coating that's easy to apply! 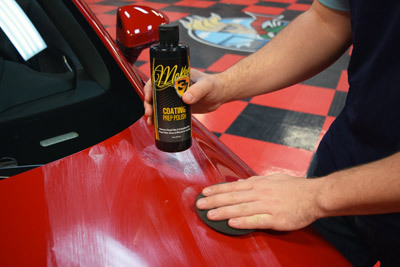 McKee's 37 Paint Coating is a nano-glass ceramic coating that provides paint protection measured in years, not months. Formulated using nano-glass ceramic particles and state-of-the-art cross-linking polymers, McKee's 37 Paint Coating creates a hard-as-nails protective barrier and a glass-like, liquid shine. The self-cleaning effect created by the immense amount of surface tension keeps your paint looking its best in between regular washes. McKee's 37 Paint Coating is exceptionally easy to apply - no lengthy instructions to memorize! 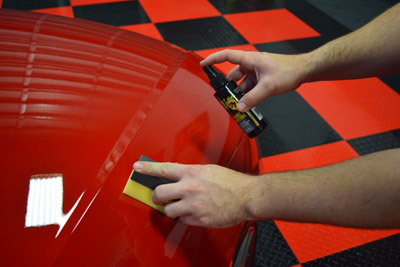 Before applying McKee's 37 Paint Coating, painted surfaces should first be polished with McKee's 37 Coating Prep Polish. This step creates a perfectly clean, smooth, contaminant-free surface for the coating to bond to. What if we told you that two-year paint protection is as easy as a spray, a wipe and a quick buff? McKee's 37 Paint Coating is that product it truly is the most user-friendly paint coating the world has ever seen. Lengthy preparation and years of experience are not required to properly apply McKee's 37 Paint Coating; simply spray, wipe, buff, and you're finished!The day of a paint coating that's easy to apply is finally upon us! While a conventional car wax or paint sealant wears off after a couple months, McKee's 37 Paint Coating forms a much stronger, harder bond that can withstand the elements to a much greater degree. McKee's 37 Paint Coating is resistant to alkaline cleaners, degreasers and harsh detergents.Removing McKee's 37 Paint Coating without physically abrading it is virtually impossible. McKee's 37 Paint Coating is comprised of nano-glass ceramic particles and state-of-the-art cross-linking polymers. As soon as these nano-glass ceramic particles make contact with your paint, they begin to fill in light swirls, pits, and pores to make the surface perfectly smooth, preventing dirt, water, oil and anything else from adhering.Vehicles that are coated with McKee's 37 Paint Coating will exhibit a highly-reflective, glass-like shine that will last up to two years! The durable shell of protection provided by McKee's 37 Paint Coating is harder than factory clear coat, making your paint less susceptible to scratches, wash-induced swirl marks, etchings caused by bird droppings and water spots caused by hard water . Best of all, this high-gloss coating is anti-static. McKee's 37 Paint Coating provides incredible water sheeting abilities. Thanks to the immense amount of surface tension created by the nano-glass ceramic particles, water will bead up and roll right off the surface, taking dirt and anything else with it.McKee's 37 Paint Coating is guaranteed to keep your vehicle cleaner than any other wax, sealant or coating available. McKee's 37 Paint Coating continues the tradition of value set forth by other car care products that bear the black and gold McKee's 37 shield of quality. McKee's 37 Paint Coating is only available in a 4 ounce container, making it an exceptional value in a crowded market where the typical paint coating is packaged in milliliters, or even CCs! A single 4 ounce bottle of McKee's 37 Paint Coating is enough to protect 4-5 full size vehicles! 2. Place your hand in a plastic sandwich baggy and feel the paint. If it feels rough or gritty, use McKee's 37 Universal Detailing Clay. 3. If your vehicle is BRAND NEW, apply McKee's 37 Coating Prep Polish. This step is crucial as it will remove below-surface contaminants and embedded dirt. If your vehicle has swirl marks or scratches, polish the paint and then use our N-914 Diluted 1:8 to wipe it down..
4. Working one panel at a time, spray McKee's 37 Paint Coating directly onto the paint and evenly distribute using the supplied applicator. 5. Work the coating into the paint using a side-to-side and up-and-down hand motion, overlapping each pass. 6. Immediately remove excess using a clean, lint-free microfiber towel. although I strongly recommend you follow the instructions and buff it off immediately after applying, so have a clean microfiber towel nearby. This coating has been on my car for 7 months now, and I maintain it with McKees Hydro Blue every time I wash. This paint coating is very hydrophobic, not so much as Cquartz UK but much more so that any wax or sealant I've tried before. After 7 months of enduring Florida weather, it still beads water like it was just applied. 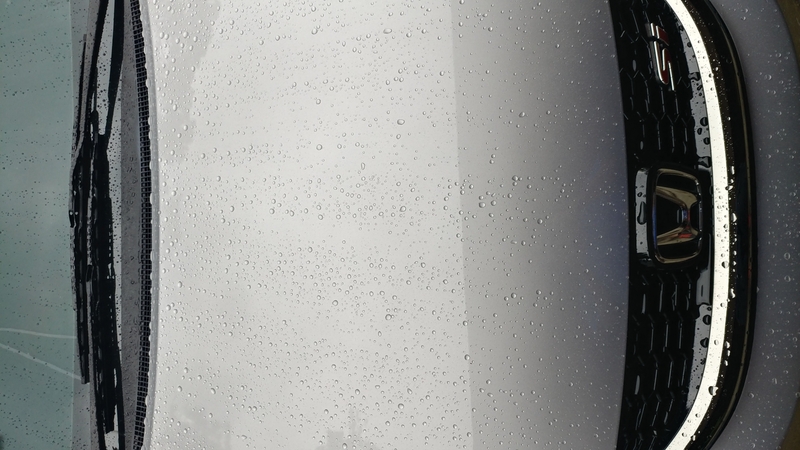 It leaves a very glass-like shine on the paint surface. I have noticed a massive reduction in wash related swirling, but it isn't a miracle cure for preventing swirls and scratches. I have noticed some slight etching from water spots in certain areas of the coating, where the car gets attacked by sprinklers with very hard water. I have also applied it to my trim, where it darkens the trim and returns it to a like new black color while also giving it very impressive water beading. Be sure to clean your applicator as soon as you can after applying the coating otherwise it will turn hard and become unusable. Also, make sure you put the sprayer in some distilled water and spray it until all the coating liquid had been cleared from the sprayer, then remove it from the water, spray it until all water has been removed from the sprayer, and make sure it is completely dry before screwing it back onto the bottle. I didn't clear the sprayer the first time I used the coating, and the coating cured inside the sprayer and made it unusable. However, McKees customer support responded to my issues nearly immediately, and sent me a new bottle of the coating, a new applicator pad, and a bottle of their Fast Polish, as I had an issue with the coating reacting to Meguiars Ultimate Compound which made the coating very difficult to remove. All in all, for $45 for 4oz of coating, this is a fantastic value and I definitely recommend it if you're looking to get into paint coatings. For the price, simply can't be beat. Given the variety of ceramic/glass/quartz coatings and generally higher pricing for these types of products, the McKees Paint Coating is head and shoulders above those when cost is a factor. Put it on a few cars in Summer 2016 and even in the midst of a NE Ohio winter, the coating is still working wonderfully. Up until the weather turned lousy here, I would hit it about once a month with either Gyeon Wetcoat or Gyeon Cure to give it a bit of a 'boost' but a few cars I used it on were pretty much 'fire and forget' and yet the coating is still doing quite well. Seem to be able to get around 5-8 mid-sized cars outta one bottle so at $5 an application (1 layer) how are ya gonna be that for cost/performance? Don't think ya can. As a bonus I got bored one day and polished/coated both the solid surface in our shower as well as the stainless steel finish on our kitchen appliances; It works very well in those areas as well, especially on the stainless appliances. Another odd place I find it to excel is on the glossy black touch pads of appliances; really kinda makes fingerprints a thing of the past. Weird, but effective. ProsVery, very economical Seems to last well Other uses besides auto paint...who'd a figured? Good product for the price. Not sure about longevity yet. Easy to use and nice finish. Easy to Use, a littlegoes a long way, Great water repellant, beautiful shine. Iâ€™m writing this review because I have rarely seen a product that does exactly what it says. I have a new Mazda CX-5 and want to protect it as best as possible. Even though it is quite late in the year it has been quite quite mild. 10 - 15 degrees Celsius. I simply waited for a 48 hour break in the rain because I didnâ€™t have access to a garage. I simply followed the instructions using the prep polish first and then the coating. Iâ€™m very impressed by the gloss and reflectivity of the finish. It was easy to do in marginal conditions and with an inexperienced do-it-yourselfer. Iâ€™m sure that anyone will be pleased with the end results. It is too cold here now to do my wifeâ€™s car, but now I have another spring project. Thanks again.